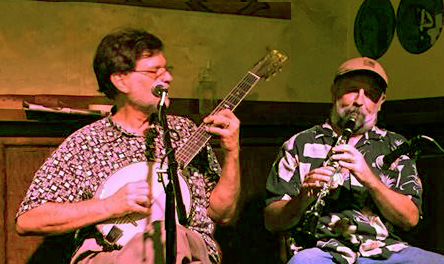 Mark Graham and WB Reid are known independently for their mastery of traditional music and membership in countless bands. Some years ago, they discovered a mutual joy in playing great early jazz tunes from the 1920s and '30s as a duo on clarinet (Mark) and banjo-guitar (WB). Their sound is fresh and unique, yet harkens back to the very formation of jazz nearly 100 years ago. Vashon resident Mark Graham is nationally revered equally for his old time harmonica playing and for his amazing, drop-dead clever songs on subjects ranging from Oedipus Rex to the mysteries and social impacts of Viagra. A founding member of the influential Seattle band The Hurricane Ridge Runners in the late '70s, Mark went on to tour with Kevin Burke's Open House and The Kings of Mongrel Folk, and play on stages with many other great musicians. Along the way he discovered the music of Sydney Bechet and added the jazz clarinet to his tool kit, forging a great improvisational style. WB Reid has visited nearly every village in the great revivial of musical traditions over the last four decades, with stops in blues, ragtime, old-time, and swing, along with musical traditions from many countries. Currently he plays with Eric & Suzy Thompson in the blues and jugband group The Todalo Shakers, performs as a duo with his wife, Bonnie Zahnow, and plays contra dances with several bands including The Rhythm Rollers. WB has developed and mastered a one-of-a-kind fingerstyle technique on the banjo-guitar (aka six-string banjo), bringing a fine old sound to jazz standards from the early 20th century. Together, Mark and WB explore the nearly lost sounds of such greats as Sydney Bechet, Louis Armstrong, The Mills Brothers, Duke Ellington and their contemporaries. Swinging instrumentals and sweet tin pan alley songs form the core of their set list, augmented with some of Mark's songs and, if they're in the mood, a couple of old-time fiddle/harmonica duets--all presented with great respect and humor.